No Alfa Romeo owner, new or old, would deny that driving our Italian sportscars is one of life's great pleasures. To own one is to have a purpose-built escape from the stress of everyday living - an Alfa and a winding stretch of mountain road is the perfect antidote for the worst that life can throw at you. Alfa Romeos are born and bred for spirited driving and draw admiring glances from anyone who appreciates classic automotive design and engineering. Now, imagine what it is like to transfer that feeling 4,000 feet above the road! 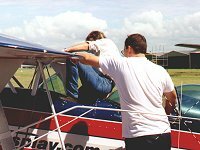 I recently had the incredible experience of flying in the sportscar of the sky - an S-2A Pitts Special. Indeed, not only did I fly in it, I was privileged to take the controls for a few minutes. Those of you who know anything of aircraft will be suitably impressed at this. For the rest of you, suffice to say that the Pitts Special biplane is one of the most specialised aircraft built - it's sole purpose is to perform mind-blowing stomach-wrenching aerobatics. It is essentially a very powerful engine bolted to a set of wings. The lightweight airframe, built of aluminium tube and timber, covered in Dacron fabric, can nevertheless stand enormous G-forces. It flies inverted as easily as it flies the right way up, thanks to its symmetrical airfoil wings. It can even fly on its side without loosing altitude - a trick known as the "knife-edge". Indeed, there are some aerial maneuvers that can only be performed in a Pitts. These little aircraft are often seen at airshows, either performing on their own or as part of a team. How I came to find myself strapped into the cockpit of one of these awesome machines was pure luck. A couple of work colleagues and I have been undertaking a series of fun little challenges of late - the one before the Pitts was to go scuba diving amongst the sharks at Mooloolaba's Underwater World. We had planned to go skydiving after that, but a technical hitch thwarted us. 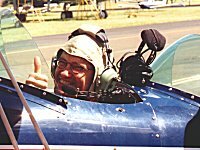 Then, Bruce, one of my contract programmers, mentioned that one of his friends was a pilot and had recently acquired an aerobatics plane. If we were prepared to pay for the cost of the fuel - about $100 for each of us - Andy, the pilot, would be happy to take us up for a spin. 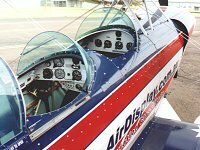 A hundred bucks for a aerobatics flight? We couldn't get our wallets out fast enough, even though it was stressed that this was not a commercial charter; Andy was taking us up as a favour and we were helping with expenses. If we were killed, there was no point looking for a nice big insurance payout. Fair enough; you only live once! A couple of days later, Bruce phoned me at 6:30am to say that the weather was just right, so I jumped into my Alfa 75 and headed across town to Archerfield Aerodrome. As advised, I had eaten a normal breakfast and, as it can get cold in an open cockpit, I also took along a thick jumper. I collected the third member of our group, Cameron, along the way and within an hour I was pulling into the parking lot opposite Hanger 3 at Archerfield. Bruce and Andy arrived shortly after and we walked into the hanger where the Pitts was stored. The building was crammed with a jigsaw of aircraft, but luckily Andy's 'plane was the closest one to the main door. We slid open the huge doors and pushed the Pitts out into the morning sunshine. The Pitts Special, originally designed by Curtis Pitts in 1944, is a breathtakingly beautiful aircraft. There have been few major alterations to Mr Pitts' design over the years and Andy's 'plane - about 12 years old - is visually little different from those flown in the 1950s. But let's face it, as with Alfas, that's what classic design is all about, isn't it? 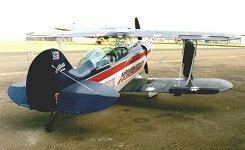 Even on the ground, a Pitts Special looks graceful, from its smoothly faired engine cowl to the aerodynamic spats covering the wheels. Andy has had his 'plane painted in a scheme representing the Australian flag and the overall effect is simply stunning. Getting ready to take to the sky in one of these aircraft is not quite the same as handing your boarding pass to the Qantas stewardess. Apart from the fact that there is no stewardess on Andy's airline, the pre-flight preparations take quite a while. First, there is fuel and oil levels to check. The fuel tank on the Pitts only holds about 90 litres, enough to feed the big engine for about two hours of flight. Next, there is the walk-around visual inspection, where every square inch of the aircraft is visually checked. Better to find a tear in the fabric on the ground than at 4,000 feet where there's not a hell of a lot you can do about it. Andy then checked all the control surfaces for free movement and finally it was time for me to climb aboard. The S-2A is the two-seater dual-control variant of the Pitts Special, with the passenger sitting in the front open cockpit, and the pilot in a second covered cockpit immediately behind. There is a set of instruments and controls in the front cockpit sufficient to fly the aircraft, while the pilot has this plus additional instruments and communications gear in the aft cockpit. Comfort is not big on the list of priorities. To get into the front cockpit, you have to be a bit of a contortionist: left foot on the narrow reinforced section of the lower wing, grab hold of the handhold on the top wing, lift your right foot a metre in the air and then swing it into the cockpit to land on the aluminium channel supporting the rudder controls. Watch out you don't bash your head on the edge of the top wing, and don't miss the aluminium channel with your foot or it will go straight through the bottom of the fabric belly. Simple, really - no worse than getting a baby capsule in and out of the back seat of a 3-door Alfasud. Andy mentioned that damage to the fabric on the Pitts is an costly event. A simple tear may mean thousands of dollars and months out of the air for repairs and safety inspections. A Pitts Special is an expensive 'plane to own and operate, much like an exotic thoroughbred automobile. Andy's operating costs are over $400 per flying hour and there a tens of thousands of dollars worth of engine, airframe and propellor inspections each year. Think about that the next time you groan at the price of Alfa parts. At the moment, Andy flies the 'plane as a hobby; to go commercial means a lot more money in terms of approvals and insurance premiums. Once in the narrow cockpit, it's time to buckle up. Remember that this 'plane is going to be inverted for many aerobatic maneuvers and some other tricks will result in negative G forces where the Pitts will be doing its best to eject me from my seat. First, there is a lap belt, much like you'd find on a commercial jet, but thicker. Once this is on nice and tight, there's another five-point harness that goes over that. This is an uncomfortable process, not the least because the seat is tilted back when the 'plane is on the ground and there are all sorts of things poking into you. Finally, it's time for the best bit - the "Biggles" headgear, a close fitting cloth helmet with integrated headphones and voice-operated microphone. "Tally-ho, chaps! Chocks away!" Once Andy was similarly secured in the aft cockpit, there were still more instrument and communications checks until, at last, it was time to fire up the engine. Andy's Pitts Special is powered by a 200 HP twin-spark boxer engine - now if that isn't music to an Alfisti when it roars into life, then I don't know what is! One indication of the regard with which a Pitts is held was how other pilots came out of their offices to watch it start up and take off, undisguised envy on their faces. Andy taxied out slowly to give the engine time to warm up to operating temperature and he performed his final throttle and pitch checks at the end of the runway. Then it was time to join the birds. In about the length of a football field, we were airborne and climbing steadily. The closest area to Archerfield suitable for aerobatics is the southern training area, about ten minutes flying time from the aerodrome. The training area is marked "dangerous" on aviation maps as aircraft in this area can be doing just about anything. Andy assured me, however, that it was a big area and we were unlikely to come across any other aircraft. Andy has over eighteen years flying experience and, apart from the aerobatics, flies a competition glider. Despite the fact that we were just about to undertake some of the most dangerous things you can do in a 'plane, I felt perfectly at ease knowing I was in the hands of a consummate professional. The convention at Archerfield Aerodrome is for departing aircraft to fly at 1,000 feet and arriving 'planes to keep to 1,500 feet. Andy trimmed the plane for level flight and once we reached the training area, he ran through the major controls and it was my turn to fly the Pitts for a short while. Wow! What an amazing aircraft; strong and stable, yet responsive to the slightest touch of the controls. I spent a few fun minutes imagining I had the Red Baron in my gunsights, then it was time to hand it back to the master and get serious. We climbed to 4,000 feet and Andy scanned the sky all around for any other aircraft before we went into the first maneuver: a simple barrel roll. That is if you think simple is being upside down for a long moment with nothing between you and the ground 4,000 feet below except a few nylon straps. The Pitts Special can fly inverted with no problems thanks to fuel delivery and lubrication systems designed to work at any angle. Next, we graduated to vertical loops, diving steeply to build up airspeed, then hard up and over. This sort of maneuver results in about one negative G, followed by about five positive Gs. Awesome! Now combine that with a barrel roll and the concept of "up" and "down" goes out the window - literally. So we may as well fly sideways for a while: the knife-edge maneuver. Now, that's just wrong - it's should be against the laws of physics or something; a normal aircraft shouldn't be able to do that. I guess that's why Curtis Pitts called his 'plane a Special. By now, Andy had got my measure. I hadn't thrown up, was still conscious and appeared to be enjoying myself as much as he was - judging from my delighted yells. It was time, he suggested, to get a bit more adventurous. Hmmm... how about a snap-roll? This is a very sudden, very violent maneuver that results in more than plus 7Gs - which is "grey-out" territory. Fortunately, the high-G is only for a short time. In fact the maneuver is so quick and violent that the G-meter on the instrument panel doesn't have time to register the forces properly. I'm writing this, so I obviously survived, but I'd be lying if I said I remembered much other than we lost about 1,500 feet almost instantly. Andy had, however, saved the best until last. 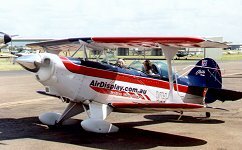 The Pitts Special can perform and recover from 17 different types of spins. One type was enough for me. Andy shoved the nose down to pick up speed and pulled up into a fast vertical climb until the aircraft became stationary - hanging off the prop - then we fell away into a flat spin. Not a violent maneuver, but constant high-Gs and totally disorienting. When I'd had enough, Andy recovered the 'plane and we pulled up into a gentle climb. Apparently, Andy performs the same maneuver inverted! Not for me, thanks. Then it was time to start heading back to the aerodrome, so Andy turned on his GPS and got a bearing home. We did a couple more loops and a half roll where we flew inverted for a while. Although these were tame compared with what we'd just done, I decided that discretion was the better part of valour and let Andy know my stomach had probably reached its limit of endurance so he returned to straight and level flight. There was, however, one last thing he had to show me. Because the engine of a Pitts is so large, and the pilot is sitting behind the passenger, front visibility is poor. To land, the pilot approaches the runway with a steep sideslip maneuver, straightening up suddenly just before the wheels touch down. For anyone used to the gentle landing of a normal aircraft, this can be a bit disconcerting, so Andy demonstrated the maneuver as we were returning to Archerfield. We touched down, taxied back to the hanger and Andy cut the engine. Only about forty minutes had elapsed since we'd fired up the engine, yet as I climbed out of the cockpit, I was amazed at how exhausted I was. The adrenaline, the G forces and the tension were physically draining. It had also been hot up there; I hadn't needed the jumper I'd bought. In fact, I should have lathered on some sunscreen because my face I was as red as a lobster. Andy took three of us up over three hours and, despite resting in between flights, he was absolutely shagged at the end of it all. We pushed the aircraft back into the hanger, then Andy went home to sleep and the rest of us went to work, something of an anticlimax after the excitement of the morning. Threading my Alfa 75 through traffic back to the city, I reflected on how fortunate I had been to experience what few people other than military pilots do. Aerobatic pilots are the aviation equivalent of F1 drivers to regular civilian pilots. The Pitts Special is a magic little aircraft that I had first read about in a "Popular Mechanics" magazine in the 1970s - never once imagining that I would one day get to fly one. But there was still more amazement to come. Back at the office, Cameron and I did some investigation on the Internet, cross-checking aircraft registration numbers, and discovered that, prior to coming to Australia, Andy's Pitts Special had actually been one of three owned and flown by the Jordanian Air Force "Falcons" aerobatics team! It had been flown at a number of airshows, including some in Europe. We even tracked down a picture of the King and Queen of Jordan inspecting the aircraft at an airshow. So, short of being able to get behind the wheel of ATECO's Alfa G1, it's reckon going to be hard to top my forty minutes in a very special little red, white and blue biplane.